Opera has come out swinging in the war against online advertising. 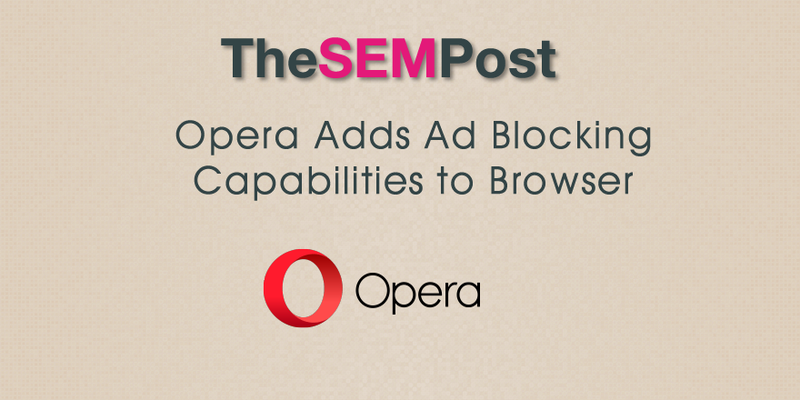 The browser has added a brand new feature in the latest version of Opera that will block ads from being displayed, via the browser itself, rather than by a third part addon or extension. They also say they are the first browser to add this feature. We are the first major browser vendor to integrate an ad-blocking feature, but this development should be a no surprise to anyone given the rising popularity of ad-blocking software and even Apple allowing it on its platform. While the option is turned off by default, when you visit a page with ads for the first time, it will suggest turning on the ad blocking to prevent ads from being displayed on that site. So while it is a conscious user process to turn ad blocking on, they will lead users to do it. However, it could be annoying at the start for this to keep asking the surfer to do so. They also have an exceptions list already added to a whitelist that will continue to show ads and seemingly will not ask if you want to enable ad blocking for those sites. If you disable ad-blocking on a website, the website is added to an exception list, which you can manage from Opera’s settings. You can click the gear icon in the pop-up to go there quickly. We added some sites there for you to test with – feel free to alter the list and add the sites you find that offer a good experience with ads enabled. Just to give some credit – CNET and TechCrunch appear to offer very good experience to their users with ads on – with only marginal delays in page loading. They use a block list from EasyList in order to know what to block and what not do. 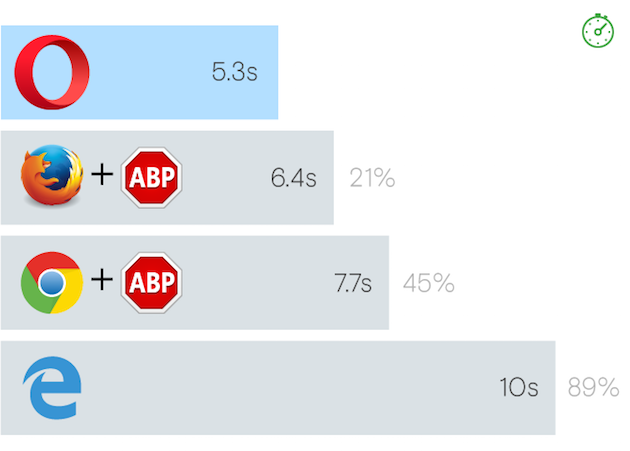 When we started profiling the performance of adblockers, we found that commonly available block lists are of great quality and can block a lot of ads. But,, many extensions spend a lot of time checking whether URLs or page elements occur in their block lists. Opera checks the block list using native code and fast algorithms, making the slowdown from checking negligible. Furthermore, Opera blocks ads as early as possible: right in the engine, when a network request for a URL is first being made. Opera currently uses block lists from EasyList, both the regular EasyList to stop advertising and the EasyPrivacy list to stop trackers. Opera also published some impressive stats comparing Opera loading page times with both Firefox and Chrome running Ad Block. It will be interesting to see if this increases Opera’s tiny market share in the default browser wars, or if users testing this in real life usage to find it better than using Ad Block with either Firefox or Chrome. But it is pretty nice to see a browser thinking more outside the box and bringing ad blocking capabilities directly to the browser itself rather than relying on compatibility with extensions/plugins in a browser.